Cocoa butter and shea butter are two of nature's richest moisturizers, all-natural beauty products that can do wonders for your skin. Each has been used for centuries as a beauty product, and both are commonly found in creams and lotions. However, there are notable differences between the two that can affect your skin for the better or for the worse. Both shea and cocoa are naturally occuring substances. Shea butter is also known as karite butter. It's made from the nuts of the karite tree found in West and Central Africa. Shea butter is sometimes called "women's gold," because its harvest and production creates jobs for many African women. Cocoa butter is extracted from cacao seeds, also known as cocoa beans. It's native to the Americas and is a traditional moisturizer in Mesoamerica and the Caribbean. Cocoa butter and shea butter are similarly prized as moisturizers. Both contain fatty acids, which improve skin moisture retention and elasticity. Both are effective in easing skin problems such as eczema or psoriasis. Most people agree that cocoa butter's smell is very pleasant, and some use it for aromatherapy. Shea butter's fragrance, on the other hand, is sometimes described as off-putting or even stinky. Cocoa butter contains cocoa mass polyphenol (CMP), which helps ease dermatitis or rashes. CMP may also inhibit the growth of cancerous cells and tumors. Shea is a good source of vitamins A and E, which strengthen your skin and help it repair damage. A 2009 study published in the "Journal of Photochemistry and Photobiology" found that the caffeic acid in shea butter reduced the damaging effects of UV radiation. In addition, shea butter contains cinnamic acid: a 2010 study published in the "Journal of Oleo Science" found that it could repel both inflammation and tumors. For acne-prone skin, shea butter is a wiser choice than cocoa butter. Cocoa butter will clog your pores, according to a report by Beneficial Botanicals. Shea butter is non-comedogenic, meaning your pores will stay clear. It may also help reduce the appearance of acne scars, because its antimicrobial properties can fight off infections. Cocoa butter has traditionally been recommended to pregnant women who have stretch marks. However, a 2008 study entitled, "Cocoa Butter Lotion for Prevention of Striae Gravidarum" found that it was no more effective on stretch marks than a placebo lotion. 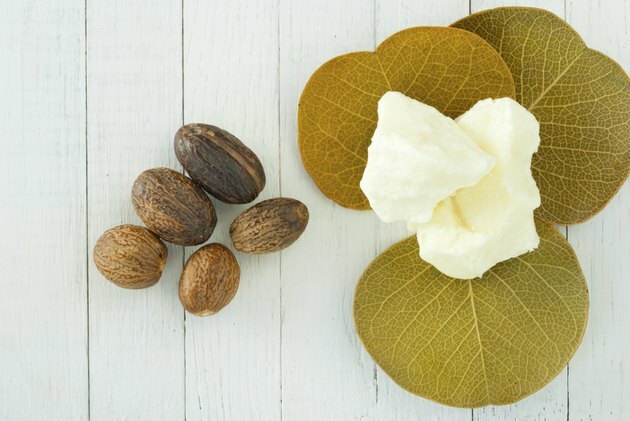 Raw, unrefined cocoa butter and shea butter have the most nutritive value to your skin, but can be difficult to find. Many products claiming to contain cocoa or shea have them in refined form, with additives and ingredients that may or may not heal your skin. You may need to pay more to receive the true benefit of these butters. In addition, shea butter quality can range quite a bit. Do you research before buying an inferior product: low-grade shea is useful only as a moisturizer.